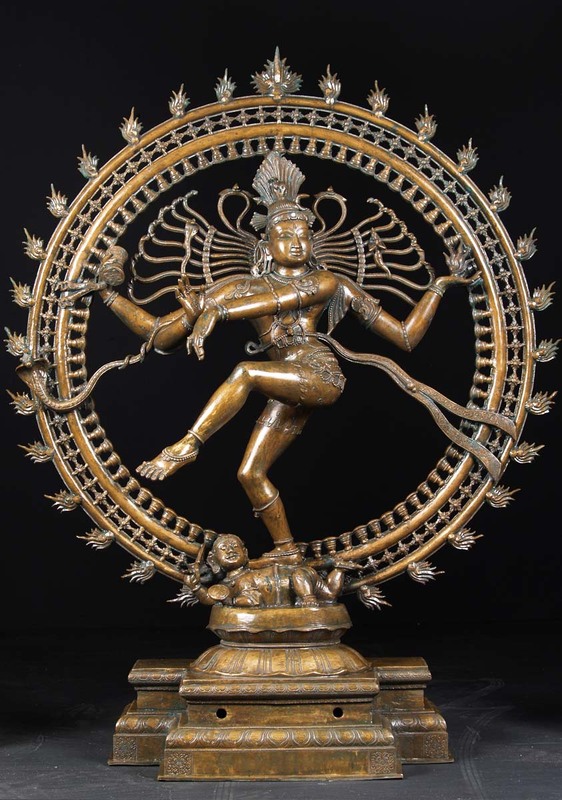 I don’t typically collect art, but I’ve always been drawn to statues of Shiva dancing. In the Hindu religion and other sects, this being creates, protects, and transforms the universe. It is a limitless, formless, transcendent, unchanging, absolute being of pure consciousness, whose essential self is the very nature of the universe. The circle in which it’s dancing represents the material world, and all of the outer flames represent its infinite expressions in the world of form, which are all creative, playful manifestations of this being’s nature. The long hair represents that of a contemplative Yogi, extending out to all of creation, representing its mindfulness of all things going on in the dance of life. In it’s upper-right hand is a drum, which is the drum of creation. Beating it brings things into existence. Notice that they represent creation with a wave of sound; in our best physical models of the universe, such as quantum field theory, the creation of particles is represented by wave-like excitations in a vibrating field, so it’s such a beautiful and accurate way of depicting the universe. Its left arm is holding a flame which represents the destruction of everything. All forms come into existence for a short time and then Shiva burns them up. All is temporary in this dance. The last arm is pointing down toward its feet and Shiva is standing on this little being which represents us and our small-minded “ego”; Shiva is working to break us, to rid of us selfishness and petty ways of thinking. This dance of creation and annihilation, this song of temporary forms, is meant to frustrate us and eventually break us down, until we once again stand weightless and spiritually centered, as represented by the other foot which is effortlessly raised, floating in the center. Eckhart Tolle explains this dynamic in other language in this video. When Shiva finally manages to break your ego’s back, you can finally center yourself, weightlessly, and escape the vicious circle of trying to find yourself in manifestations of form. The constant frustration causes you to dig deeper and deeper, looking for something that’s “real”, until you finally reunite with this great power of infinite love deep within your soul, leaving you in a timeless peace which transcends anything in time and space. You can call this God, your spirit, consciousness, awareness, the infinite, whatever, but the most important thing you can do for yourself is connect to it. If you find it, you’ll be like the apostle Paul when he wrote to the Phillipians, “I have learned to be content whatever the circumstances. I know what it is to be in need, and I know what it is to have plenty. I have learned the secret of being content in any and every situation, whether well fed or hungry, whether living in plenty or in want. I can do all this through him who gives me strength.” The language is obviously Christian, but its meaning is the same. The only thing you have to know is that you are, just as God is and always has been, and that you share this nature as well. Everything will be alright.